While many enjoy a good New Year’s Eve party, one thing you realize the next day is that just because it’s another year, doesn’t mean you leave what happened before behind. Not entirely, at least. We may have grand aspirations and lists of resolutions, but when it gets down to it, we’re much the same in 2016 as we were in 2015. That’s as true for businesses as it is for people. That’s unfortunate for DC Comics. If anyone in the comic industry could use a fresh start, it’s them. While they’ve earned a spate of positive PR from fans for some of the moves they made during the previous calendar year, what they haven’t done is succeed at the core principles to their business. And when I say that, I mean their orders are down, shops are having a hard time moving their product, and perhaps worst of all, their readership is dwindling. In short, DC Comics is struggling. Or at least that’s what the numbers say, and the numbers? They’re not DC’s friends. Look at the chart below, which maps out DC’s market share by total units ordered for both 2013 and 2015. I chose 2013 because by then the New 52 bump had mostly dissipated. This was DC at a more realistic level. And as you can see, it was a much higher one than they’re at today. 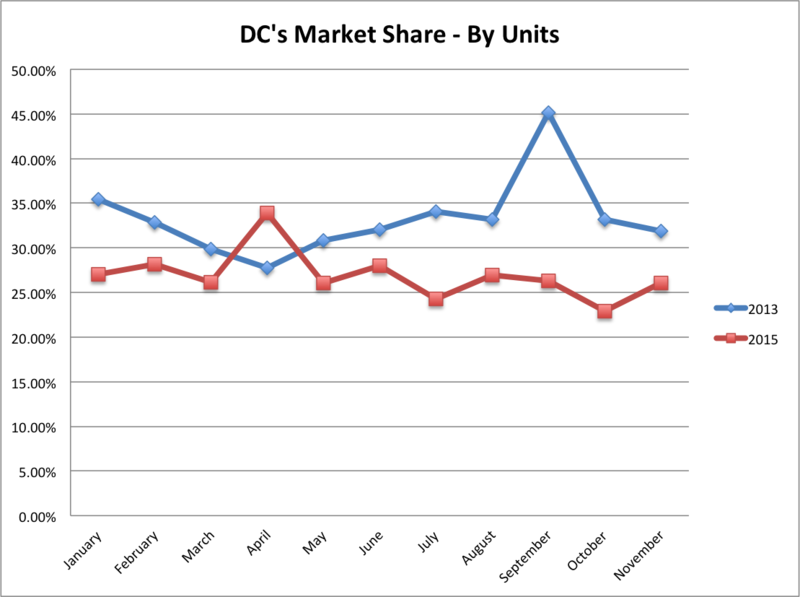 DC had higher market shares in 2013 in 10 of the 11 months shown, which means they’re performing worse in the market now relative to their competitors. That’s a problem, and one compounded by the almost ten percent divide between many of the months. While you could argue that because the whole comic industry is growing, DC’s performing about as well as they were before (unit wise, at least), there’s a flaw in that argument. That means in an expanding industry, DC’s competitors are selling more comics. The numbers agree, as you can see in the chart below (numbers based off estimates by Comichron). 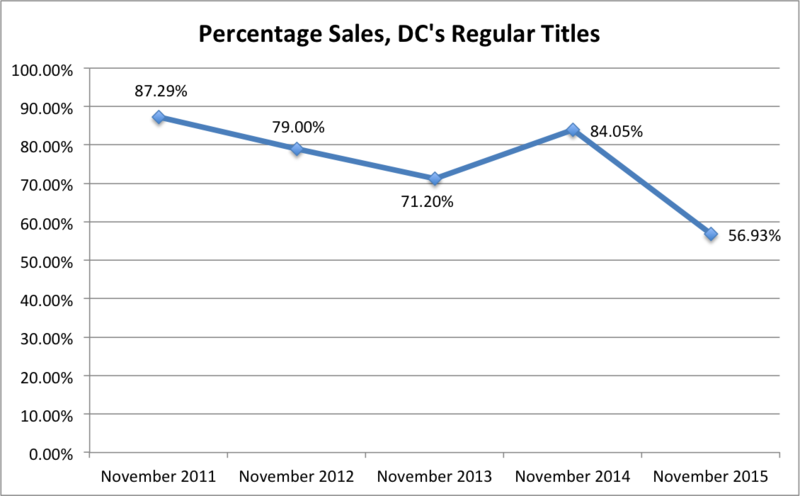 Looking at the past five Novembers, you can see DC’s orders have stayed flat since 2013. A slight decrease, but nothing to write home about. Staying at that level isn’t a crime, by any means. I’m sure there are a lot of publishers who would love to move 2.3 million units in a month. And sure, the market’s growing, but that’s still a nice number. However, where it gets concerning is when you see what those 2.3 million units are comprised of. The short answer? Not what it used to be. This chart could use a little explanation. For both Marvel and DC, they do events and special titles every once in a while, but their bread and butter are the ongoing titles that form the sustainable baseline for sales every month. You know, titles like Batman and Action Comics and what not. That’s what I mean by regular titles. Typically, you’d be talking about 52 different comics at the heart of everything DC does. And for a long time, that had been the case. As you can see above, in Novembers past, those titles comprised somewhere between 71 and 87% of their overall units ordered. That makes sense given the nature of DC. However, 2015’s iteration only saw a little under 57% of DC unit sales coming from its ostensible regular titles, meaning the 2.3 million number mentioned earlier was goosed by books DC can’t rely on outside of their short lifespans. While it’s great to have Dark Knight III top the sales charts, what this means is DC’s core product is faltering and in a way that’s unlike any time in the past. 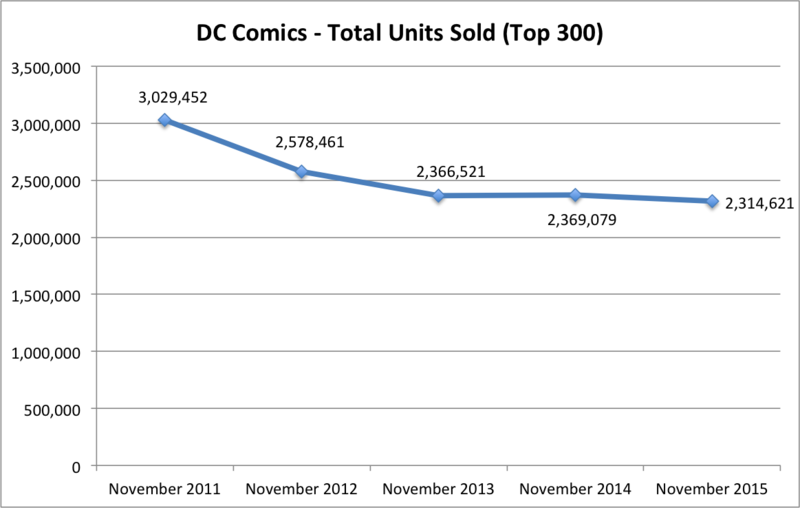 November 2013 was the closest comparison from the chart, but even then, DC was selling almost 400,000 total copies or 9,000 copies per title more of its main books. So the 2.3 million number isn’t likely as sustainable as it had been in the past. Not by a longshot. So like I said, DC’s struggling. But what did it? What broke the House of Bat? It’s a complicated answer, but let’s try to find out. For any problem of substance, it’s hard to ascertain what event triggered everything. More often than not, that’s because it isn’t a solitary act that caused issues to arise; rather, it’s a combination of factors. DC’s the same, and I bet if you asked 100 industry types, you’d get 100 different answers as to what caused this downturn. While there are enough for several articles worth, I wanted to focus on the four at the center. And oddly, everything starts with the biggest announcement in DC’s recent history, and one DC’s still paying for to this day. The day was May 31st, 2011. DC revealed their entire line would relaunch in a brand new universe in September. It was the New 52, and it was one of the boldest moves in the history of comics. This is where you might think I’d beat the dead horse that is the New 52, but you won’t find that here. While it wasn’t the pinnacle of comic book creativity, there are many reasons it should be celebrated. The New 52 was the gasoline that ignited the fire of the comic industry’s renaissance. Ask almost any shop owner and they’ll tell you the New 52 wasn’t just a sales bonanza; it was driving in new and lapsed readers to their shops. It was a boon to the industry. The issue wasn’t with the relaunch itself. It was with the number in the title. “52.” Because of its history and the obsession DC had with it, 52 was the number of regular comics they decided to produce every month. Their devotion to it lasted for almost four years, and because of that, DC had to publish many comics that perhaps they never should have. They stuck with low selling books for far too long to keep at 52, and when those fizzled, they replaced them with other titles that were effectively cannon fodder. When those books didn’t sell in-store, shops dropped their orders, and as tends to happen after that, cancelations followed. At the top, DC did well enough for years. But the lower tier sellers were an anchor on the whole line that soured both retailers and readers. It seemed like DC learned their lesson on this subject with DC You. They relented on the 52 marker and for most of 2015, it appeared they were winding down their release list. However, if December is any indication, they’re back to overproducing in a major way. DC shipped a staggering 135 releases in the final month of the year – a full 14 more than their previous high in 2015. That’s the wrong direction. Retailers have shared that this overproduction is one of DC’s biggest problems. The numbers back it up. Maybe the worst part, though, is how that fateful decision was the first domino to tumble and create even more problems. If you’re going to publish 52 books a month, you better have a comprehensive rolodex of creators at your disposal. And it’s DC Comics. They do. And at first, the New 52 launch titles had a bevy of A-listers working on them, although not enough to fill out such a considerable line. However, as time passed and Image Comics took the leap, a shift took place in how creators were aligned. As Marvel’s top names moved over to work on their own books at Image, Marvel had to find replacements somewhere. So Marvel mined its closest competitor: DC. Names like Charles Soule, Kenneth Rocafort and Tom Taylor migrated, and DC’s A-list became Marvel’s A-list. But DC kept publishing the same amount of titles and they filled in the blanks where they could. While they’ve had wins in the mix – Brenden Fletcher, Tom King and Babs Tarr, for three – mostly, they’ve had to play back the hits to fill out their line. That left them with a bevy of serviceable yet uninspiring books. Readers and retailers reacted accordingly. As mentioned in the Too Many Comics section, DC’s decision to stick to 52 releases for several years led to them cycling titles often. While not a problem on the surface, it’s a problem in actual application. That’s because with every new title you swap out, the inherent likelihood it will interest a wide audience degrades. You typically start with the most marketable options. DC faced a situation where their first choices didn’t sell, so they moved on to their second. And when the second choices didn’t either, they moved on to their third, and so on and so forth. Canceling and replacing titles is standard business practice in comics. It’s something that happens on the regular. The problem doesn’t lie with that simple act. It’s when you keep replacing unmarketable books with other unmarketable books that it compounds and everyone loses interest. That’s what happened with DC. The past four years for DC have led to a litany of unmemorable titles with no obvious audience. While some may have been drawn in by Green Team: Teen Trillionaires and Larfleeze, those readers proved to be the exception to the rule. And DC’s latest vaunted effort – DC You – has been no different. The line included a couple obvious hits (Justice League of America and Black Canary) and an assortment of others that were effectively dead on arrival, according to retailers I spoke with in September. It wasn’t just them, though. 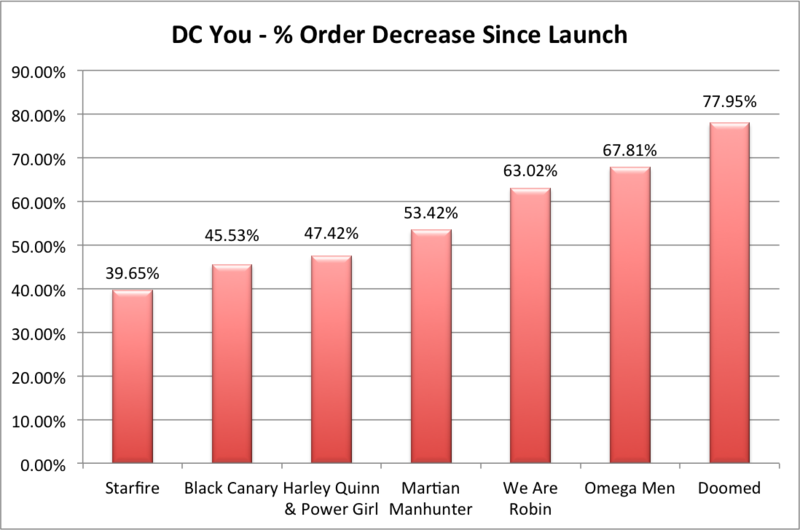 Look at how the DC You books have plunged in orders since their launch. The predictable books did okay. Starfire, Black Canary and Harley Quinn & Power Girl were books with significant built-in interest, as was Martian Manhunter to a degree. But then there’s Doomed. Its orders have dropped by over three quarters since launch. And while Omega Men has a passionate fan base, it is a small one. DC’s been thinking outside the box on the regular, but its audience isn’t responding and the books aren’t selling. That’s a major contributing factor to their current struggles, and one compounded by DC’s odd choice to avoid almost certain mid-tier performers like a print Supergirl title or something for those excited by the upcoming Legends of Tomorrow show. The last point is a big one. As many shop owners have pointed out, breaking reader routines can wreak havoc on in-store sales. It’s why both Convergence and Marvel’s own Secret Wars gap proved problematic. By giving readers a period where their habits change, you give them an opportunity to reconsider what they’re doing and adjust what they’re buying. And Convergence did that in a big way, as Brian Hibbs noted. It continues to impact buy-in from readers more than half a year later. Just look at how much some titles at DC have dropped in orders since Convergence. You might wonder why Batman’s in the mix. Good question. Batman’s context for the rest, as it often acts as for the industry. That shows what a regular decrease looks like, even if it’s more than Batman is used to. Some of its confederates, however, haven’t fared as well. Secret Six – which, admittedly, was early in its run when Convergence started – has crashed. It’s the same with the since canceled Justice League United. The saddest drop of all, though, falls on Batgirl, which has seen orders drop by almost 30% since Convergence despite the creative team staying steady and the book continuing to be the same delightful read it was when they first started. 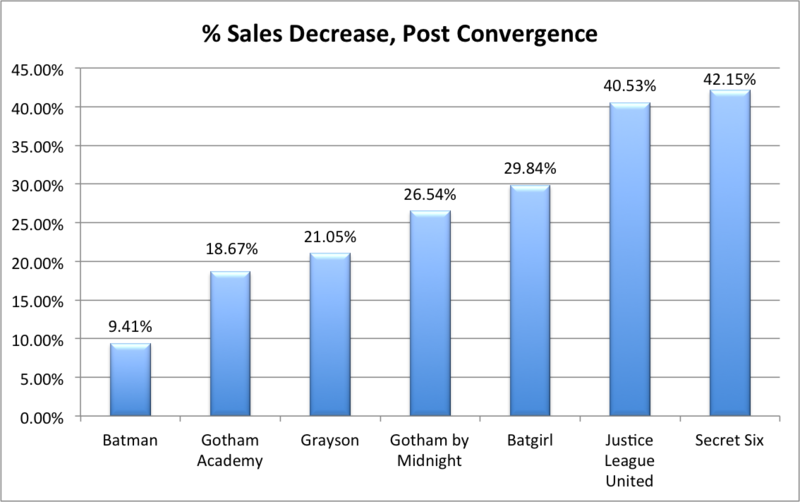 Months later, retailers have had to adjust orders to match post-Convergence buying habits, and the gap months created by DC’s line-wide event impacted its titles in a big way. The former is going to happen. In fact, it already is happening. 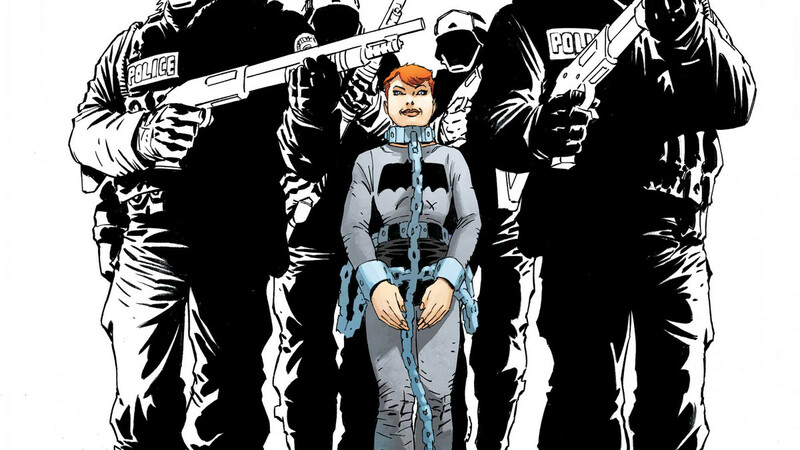 Dark Knight III is being ordered like its cover is made of $100 bills and retailers I’ve spoken to share it’s selling well in-store. But that’s not a cure-all. It doesn’t solve the dilemma the entire line is facing, which are problems that will only be exacerbated with the passage of time. Even with DKIII buoying their numbers, it’s my belief DC will have a rough first quarter. There are no obvious fixes on the horizon, either, which is why they turned to step two: double-shipping. While little is known about this move so far, what we’ve heard is it will not be the whole line. Knowing what we do about the idea – selling two issues of select (likely top) books every month instead of one – and applying simple math to the situation reveals that yes, this will result in higher sales for DC (or at least for a time). It will inflate sales and market share and all those good things. But this is a bad idea, and one that could accelerate their trend. The reason for that is a question, actually. It’s a simple one: who is double-shipping for? Is it for the retailers who order their books? No. If you follow shop owners like Hibbs or the team at Big Bang Comics, you’d see shops are already struggling to sell the books once a month. Even major titles like Wonder Woman are faltering, so it’s not just the ones at the bottom. Doubling their output won’t help matters. Is it for the readers? Not likely. Outside of Batman and a few other books, readers have shown a general disinterest in much of DC’s line. Is it for the comics themselves? Of course not, as increasing the frequency of their release makes it unlikely creative teams will be stable. And as previously mentioned; DC doesn’t have the creator bench needed to handle this unless they look elsewhere. Art is their weakest area, too, and artists will have to rotate because of the oppressive schedule double-shipping requires. An issue becomes an even bigger issue. So, again, it’s on the table that this decision will lead to short-term gains but even greater long-term losses. Besides the boost to sales that might tide them over until more sweeping changes, there’s little DC could gain from it. If I was a cynic, I might say DC’s hoping double-shipping will allow them to put more product out without retailers being able to account for poor sales at FOC, but I doubt it. That kind of gamesmanship does them no favors with retailers. Some may wonder how this differs from what Marvel’s already done for years. On the surface, it isn’t different. Context changes things, though. Marvel had the retailer faith, reader interest and the creative depth necessary to make that schedule work, or at least for the most part. DC? Lacking those things, double-shipping could just make a bad situation worse. It feels like a desperation ploy. A full court heave at the end of a basketball game, even though they’re down 7. So what should they be doing instead? I’m glad you asked. When researching this, I suggested on Twitter this section would be one image. It’s not far off, still. I’ll be honest: I don’t have perfect answers for DC. I’m just a guy in Alaska who thinks about this kind of thing way too much. If I had a surefire way to revive their prospects, I’d be contacting Dan DiDio, not writing this. Beyond that, DC is filled with a whole mess of bright people. The comic industry is cyclical, and the solution may be as simple as giving those people time to do their job. But that doesn’t mean I can’t throw out ideas. On the next Off Panel, Hibbs shares his thoughts on DC’s downturn, and one of his central thoughts is this: they lost readers when they lost the universe. He theorized people care about the interconnectivity and history the universe provides, and when they killed that, they lost their core audience. I don’t disagree. Somehow, DC needs to find its way back to making their line feel unified without making every read required. That doesn’t mean incessant crossovers or even going back to what it once was. It means a line of books moving in the same direction, and one that represents the DC of yesterday, today and tomorrow. If DC’s gotten anything right in its recent past, it was giving Mark Doyle the keys to the Batmobile. The part of DC that receives the least complaints and the most praise is the Bat line, and it’s because of what Doyle and his team has done to both reinvigorate the supporting books and embrace what was already working. Sadly, that just made the difference between the Bat line and the rest of DC’s books even more stark. Which is why I’d give Doyle even more responsibility. Make him an architect of the entire line, and someone who is tasked with doing one thing above all others: making DC’s comics good again. With his Vertigo background, he has the trust of many creators – people like Scott Snyder, Becky Cloonan and Cameron Stewart are effusive in their praise of him – and a good eye for talent. If I were DC, I’d give him a shot at making his mark in an even bigger way. This one is easy. DC’s producing far too many comics these days, and they don’t have the creator depth, reader/retailer interest or amount of clearly marketable titles needed to handle the amount they are releasing. If DC’s looking to resuscitate interest in their product, paring down the line to a streamlined list of only high quality titles would go a long way to rebuilding retailer confidence. It would generate plenty of doomsaying on Twitter and thinkpieces online about DC’s future, but in the long run, it could be what they need. While they’re employing plenty of quality vets, I’d be doing everything I could to find the next generation of DC creators. The medium is as fertile as ever on that front, and I’d be looking everywhere to find not just the writers and artists of today, but tomorrow too. The good news is they’re already on this one. 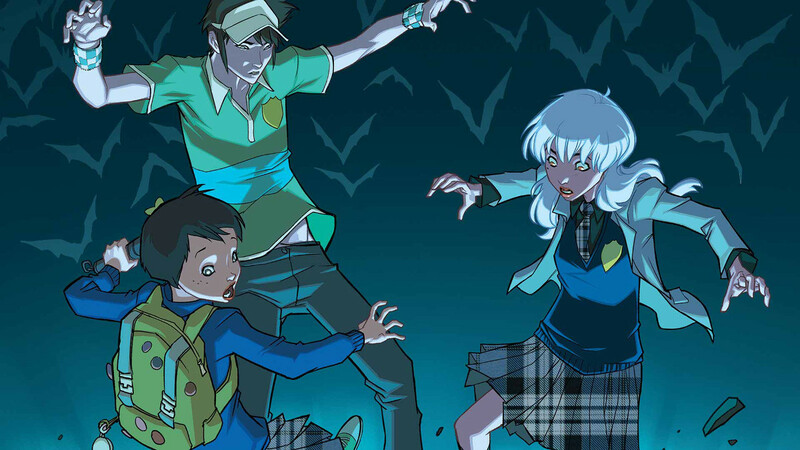 Their new writer development program that’s being taught by Scott Snyder kicked off recently, and it’s a positive first step. But they need to do something on the art side as well. Step Five: Do. Not. Relaunch. At this point, DC is almost certainly considering relaunching. It’s what publishers do these days. However, that might be the final nail in their coffin. If I’ve learned anything in recent years from retailers, it’s this: new #1’s are jumping off points as much as they are places to jump on. And if DC did it again, it may chase away their remaining audience. If I was a betting man, I’d say it will happen and in the not so distant future. But I’m hoping I’m wrong. Because here’s the thing: I want DC to succeed. I’ve been a fan for a long time, and my biggest issue with all of what has happened with them is I just miss loving their comics. I grew up on Bart Allen and Wally West and Courtney Whitmore and and Tim Drake and Kyle Rayner and a whole mess of others. Once upon a time, I marveled at the gods at the top of their line and related to the normal people doing good things elsewhere. DC’s a pillar of my personal comic history, and I’d love for them to reach those heights again. And everyone in comics should. I’ve said this before and I’ll say it again: the comic industry is healthier when Marvel and DC are in a good place. It helps the direct market and it helps comics as a whole. You’d be surprised by how many creators and readers I know who got into comics (or back into them) because of the New 52 and are now reading renowned comics like Saga or Kaijumax or SuperMutant Magic Academy. DC maintaining their standards means more readers in shops and comiXology and bookstores looking for one comic and maybe finding something else. That’s good for everyone. Header art by Jason Fabok from Justice League #41’s cover. Note: this article was developed and written before Diamond’s December order numbers arrived. Numbers were primarily derived from November 2015 and before, with details from December sprinkled in throughout. All numbers were pulled from Comichron. Come back tomorrow for an extended look at the year in comics from a retailer perspective, including even more on DC.